A colloquial term referring to a medical device known as the negative pressure ventilator. The device is a large metal tank that can accommodate a human body, providing mechanical respiratory assistance for patients who are unable to breathe on their own. 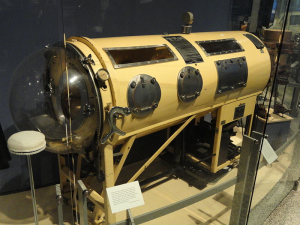 A basic model of the negative pressure ventilator tank was constructed in 1927 by Philip Drinker and Louis Agassiz Shaw at Harvard University. Although later models have improved functionality and comfort, the principle design was maintained, with an electric motor powering a pump that changes the pressure inside the airtight metal tube, simulating the pulling of air in and out of the lungs. Negative pressure ventilators were used extensively in hospitals in the 1940s and 1950s during the polio epidemic. They are still used in many cases where patients, for a variety of reasons including paralysis and temporary disabling of the diaphragm, fail to breathe normally on their own. "Tank respirator, or iron lung, used at Union Hospital, Terre Haute, Indiana, from 1953 through circa 1973," photogrpah by Daderot.